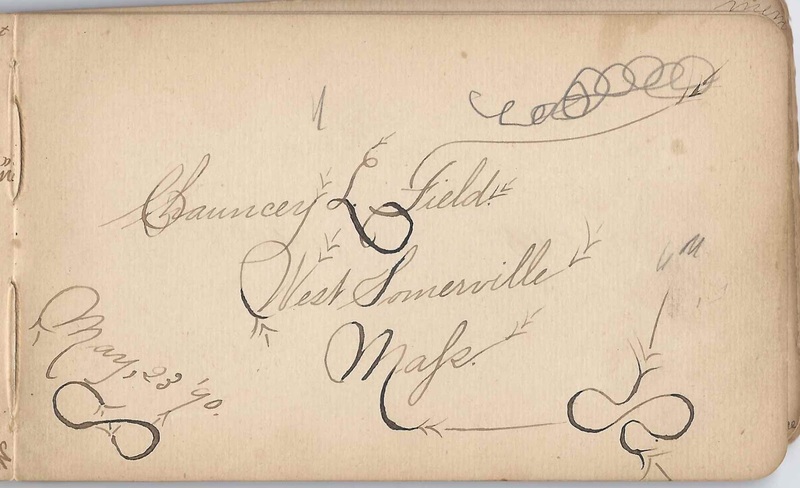 1880s autograph album that belonged to Edith Williams Belcher of Cambridgeport, Massachusetts. The album contains pages signed by Edith's relatives and her future husband, Chauncey Leroy Field. 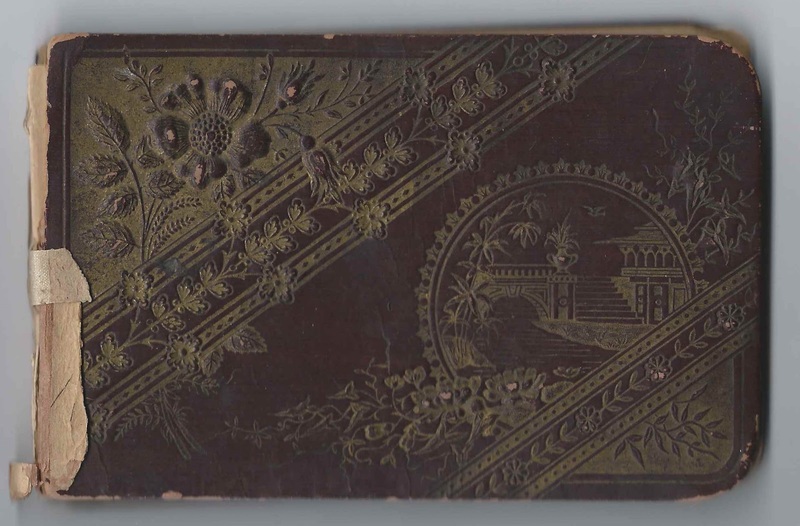 The album is approximately 6" x 3-3/4" and contains the sentiments of 19 of Edith's relatives and friends. An alphabetical list of the signers appears at the end of this post. Edith Williams Belcher was born 5 November 1875 at Cambridge, Massachusetts, the daughter of Joseph W. Belcher and Sarah Annah (Comey) Belcher, who were both natives of Foxboro, Massachusetts. Edith's father Joseph died in 1888, during the time that the pages in the album were collected. 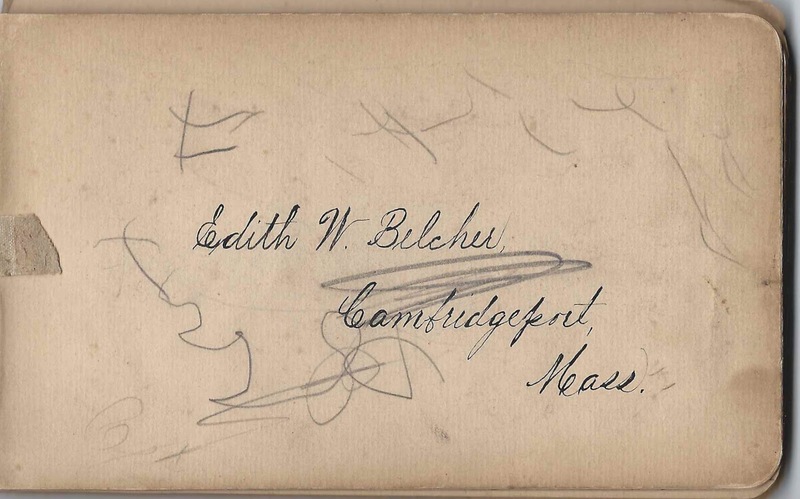 I believe that the Sarah Belcher of Cambridgeport, Massachusetts, who signed a page on June 29, 1894 was Edith's mother, Sarah Annah (Comey) Belcher. Sarah Annah (Comey) Belcher's mother Lydia F. (Morse) Comey of Cambridgeport, Massachusetts, signed a page on April 21, 1886. Someone later added a note that Lydia died on May 8, 1896. 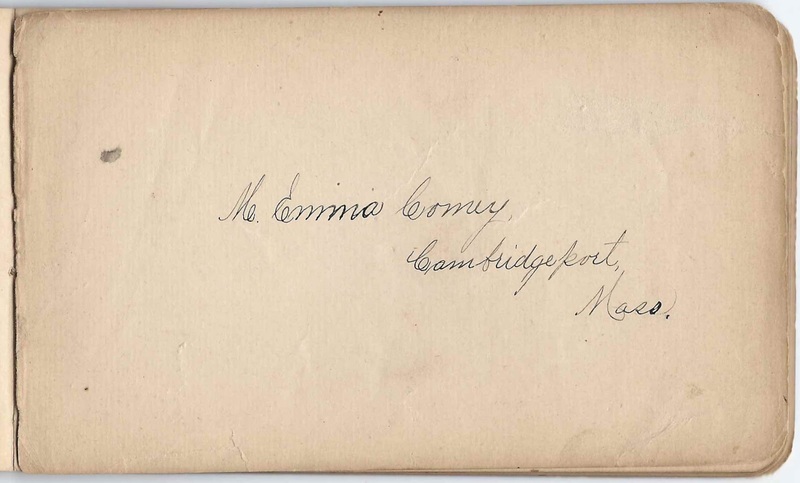 The M. Emma Comey of Cambridgeport, Massachusetts, who signed a page, may have been Mary Emma Comey, daughter of Lydia F. (Morse) Comey and sister of Sarah Annah (Comey) Belcher. 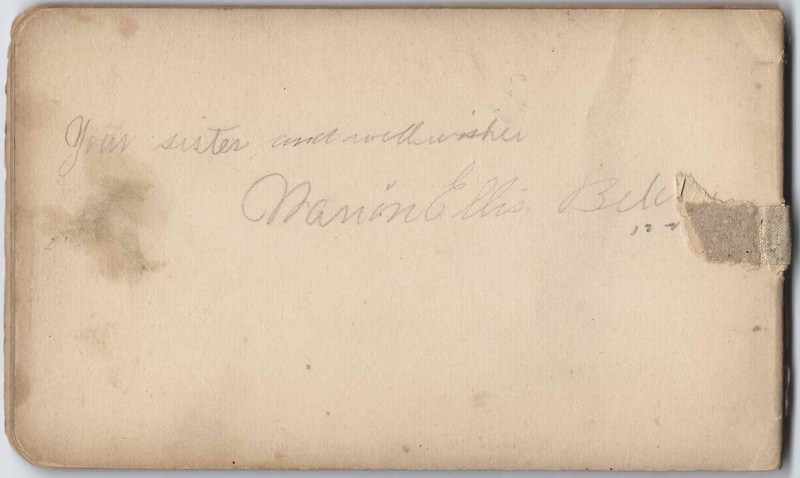 Edith younger sister Marion Ellis Belcher signed two pages in the album, one of them on June 29, 1894. Intriguingly, one of the signers had the surname Ellis; it's possible that Marion was named in her honor. The signer was Clara M. Ellis, who is listed as boarding with Edith's maternal grandparents, George and Lydia Comey, and working at a tin factory in the 1880 Census of Cambridge, Massachusetts. Marion Ellis Belcher was born in 1884. Clara was born at Wellington, Maine, about 1857, the daughter of Adkins Ellis, Jr., and Abigail (Dore) Ellis. On 30 September 1885 at Wellington, Maine, Clara married Ansel F. Corson, son of Isaac Jerry Corson and Asenath (McPhee) Corson. They were listed in the 1910-1920 Censuses of Athens, Maine, but it seems that they were not always together, perhaps because of economics or strife, as I also found Clara in other Censuses during those times. They had at least seven children, perhaps more. Sadly, according to the death records, on June 17, 1922 at Athens, Maine, Ansel killed Clara and then fatally shot himself. On 14 October 1896 at Somerville, Massachusetts, Edith Williams Belcher married Chauncey Leroy Field, son of Roderick D. and Annie Gertrude (Colhappe or variant) Field, who were born in New York and Kentucky, respectively. Chauncey was born 5 November 1871 at Cambridge, Massachusetts. Edith and Chauncey raised their four children at Somerville, Massachusetts. I believe Chauncey owned or managed a laundry business. From what I could find, Chauncey died about 1931 and Edith in 1960. 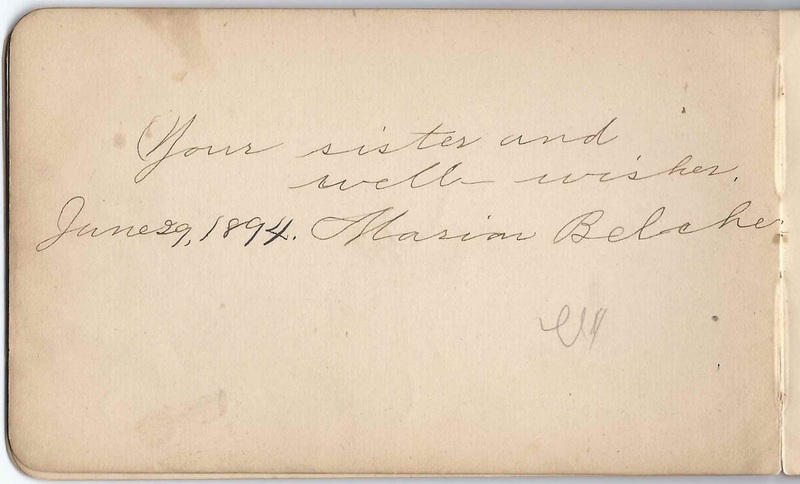 Marion Belcher, signed on June 29, 1894; Edith's sister Marian Ellis Belcher, who signed another page in the album as well. 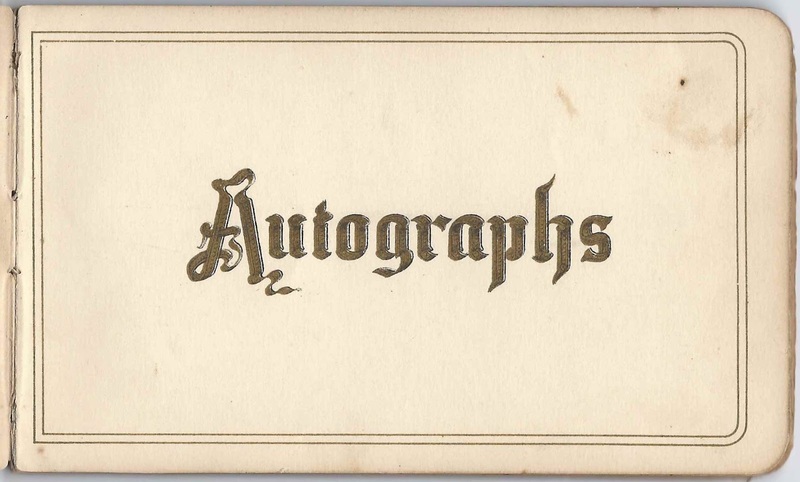 Sarah Belcher of Cambridgeport, Massachusetts, signed on June 29, 1894. She may have been Edith's mother Sarah (Comey) Belcher. 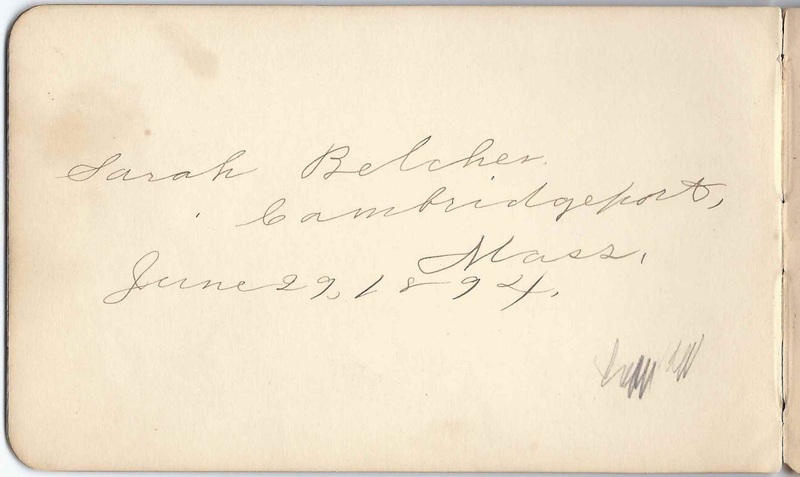 Florence E. Belcher of Hyde Park, Massachusetts, signed on August 31, 1887; Edith's cousin Florence Estelle Belcher, daughter of John E. and Sarah E. (Corbett) Belcher. John E. Belcher was an older brother to Edith's father Joseph W. Belcher. 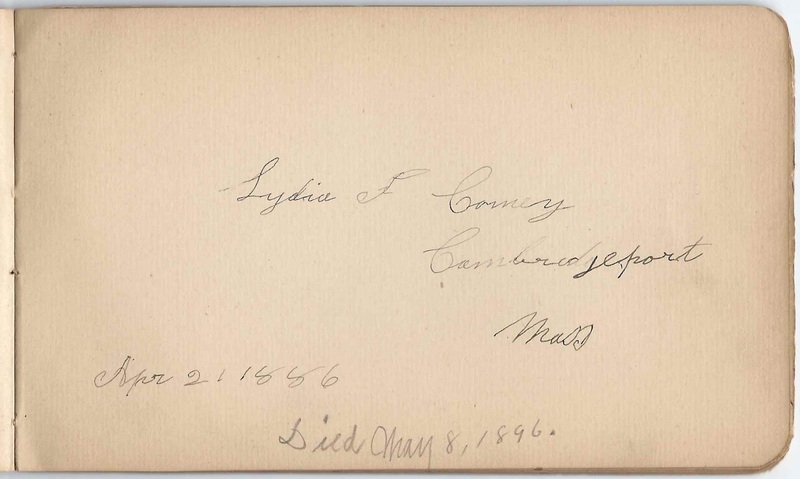 Lydia F. Comey of Cambridgeport, Massachusetts, signed on April 21, 1886. She was Edith's maternal grandmother, Lydia F. (Morse) Comey. A note on the page indicates that Lydia died on May 8, 1896. M. Emma Comey of Cambridgeport, Massachusetts. She may have been Mary Emma Comey, a sister to Edith's mother Sarah A. (Comey) Belcher. 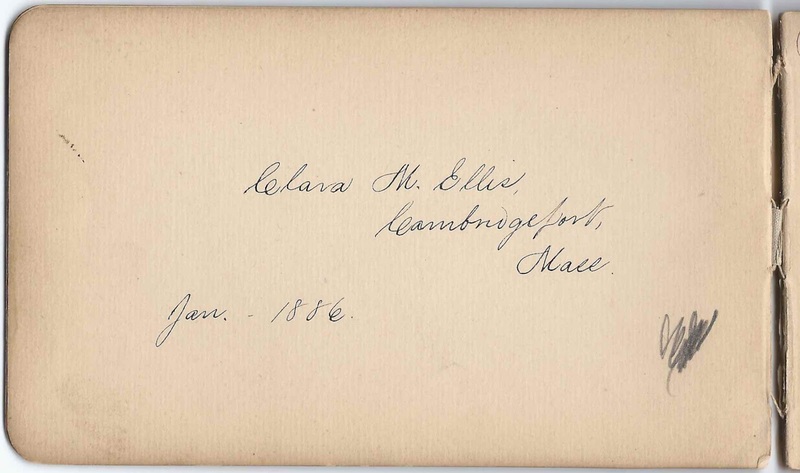 Clara M. Ellis of Cambridgeport, Massachusetts, signed in January 1886. She was born at Wellington, Maine, about 1857. See more information on Clara in the body of this post.